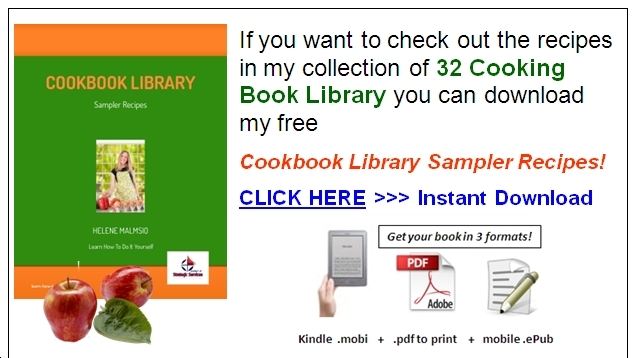 This page will show you the simple steps for how to learn healthy cooking. You will be relieved to know that making just a few small changes when you prepare meals can make a big difference in the health of you and your family. If you’re trying to improve your health, one of the first things you can do is improve the way you cook your food. But when people talk about healthy cooking, it can sound a little intimidating and a little less than delicious. But healthy cooking doesn’t have to be difficult or boring. Once you get used to doing things a different way, it will become simple and easy. You’ve already made the hardest decision…deciding to eat healthier, but now you want to know how you can make the transition to healthier foods. This is especially true for those with families as they aren’t just preparing meals for themselves, but for everyone else in the family too. 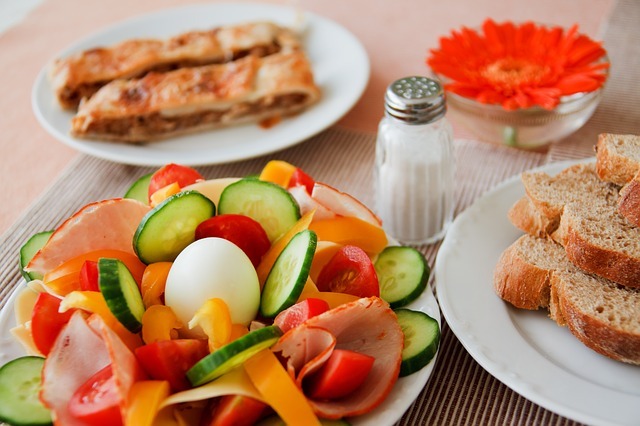 Below are a few tips to help you make the transition to eating healthier foods. The first thing you should do is research various diets and healthy foods. Look at the foods that make up different diets and determine why these foods are considered healthy. Then, decide which foods in your current diet you are going to replace. You’ll also need to determine which healthy food choices you’re going to add to your diet to. Deciding which foods to add and subtract from your diet can be difficult. This is why many people choose to make a replacement chart…basically, these charts help them stay on track. If you would like to make a chart, start by making two basic columns on a piece of paper. In one column, write down the foods you would normally eat and on the other side, write down a healthy alternative. For example, if you may have a bowl of ice cream wrote down on one side and across from it have a bowl of fresh fruit salad for the alternative. As you make work on your chart, remember that it’s good to replace white grains with brown/whole grains, processed foods with whole foods and artificial foods/flavors with natural foods/flavors. Finally, don’t try to transition too fast. Start by working on one thing at a time and then move on to another item on your list. Increase Your Daily Food Intake. A good way to get more, healthier foods in your daily diet is to increase the number of times a day you are eating. Make a point to eat a few snacks a day and make sure they are high-quality, whole foods. This will get more, healthy foods in your body and leave less room for the unhealthy foods. It will also make the transition of switching to healthier foods easier. With all of the junk foods out there today, getting kids to eat healthy can be a trick. 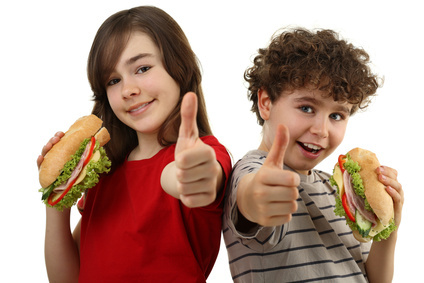 In fact, many kids associate the term “healthy food” with something yucky. However, this doesn’t mean that you can’t change your kids’ minds about healthy foods and get them to enjoy eating healthy. Below are some tips to help you out. · Add pureed winter squash, carrots or sweet potatoes into cheese sauce. · Steam a few veggies (broccoli, carrots, green beans, etc.) and put in a blender with a jar of spaghetti sauce. Blend them all together and serve over spaghetti. Your kids will never know they’re eating veggies too! 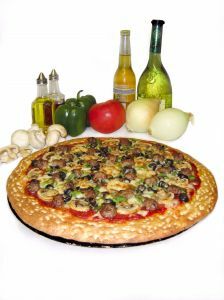 · Mince veggies such as broccoli and add to homemade pizza – it’ll never be noticed. 2. Take it slow and replace one food at a time. Getting kids to eat healthy can be like pulling teeth when you try to make a bunch of dietary changes at once. · Stop using white flour products and start using whole wheat flour products. You can easily do this with breads, pastas, cereals and the baking flour you use at home. This is a food change that your family won’t likely notice. · Replace frozen chicken nuggets and fish sticks with a homemade version. Do this by cutting up healthy pieces of meat, coating in bread crumbs and baking them in the oven. · Don’t make a full transition right away. Instead, ease into it. For instance, replace only ½ or so of the white rice in a recipe with brown rice. The next time you fix it, replace 2/3 of it and then the third time you make it, replace all of it with the brown rice. 3. Read to your kids about healthy foods. Young children love to have stories and books read to them. So, why not start reading to your kids stories that talk about healthy foods? If you have older kids, take them to the library and help them choose an educational book about eating healthy and how healthy foods enhance the body’s functionality. 4. Be positive about food. Help encourage your kids’ curiosity about healthy foods by being positive about food. One way to do this is to ask your kids to help you prepare dinner. 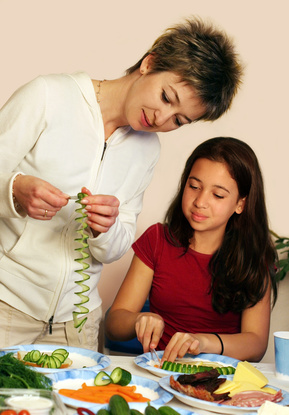 Let them get involved in the preparation process so they can learn about the foods they’re eating and how all the ingredients go together to create a healthy, yet tasty, meal. We’ve all heard about “superfoods” and the additional benefits they have for our bodies. Well, now there are four more superfoods that you should be aware of. They are: Acerola, Maqui Berry, Cloves and Baobab Fruit. Below you’ll find a little bit of information about each of these nutritional powerhouses and why you should add them to your grocery list. 1. Acerola – Acerolas are grown in Central and South America and are often marketed as Amazon or Barbados cherries. The skin is a yellowish color, but it’s the vitamin C content that has everyone amazed. They have 40 times more vitamin C than oranges! This gives them an extremely good antioxidant ranking. These little guys are hard to find in the produce section of the grocery store, but can be found in extracts, powders and capsules. 2. Maqui Berry – The Maqui Berry is grown in Patagonia, which is located on the southern tip of South America. Maqui Berries are similar to blueberries as they’re known for their antioxidant qualities. In fact, while blueberries rank well on the ORAC score, Maqui Berries have a score that’s 10 times higher than blueberries. It’s also said that the Maqui Berry may also help control weight too. 3. Cloves – Cloves have been around for a long time, but haven’t been known as a superfood until recently. Spanish researchers have recently found a potent antioxidant activity within cloves that has gone unnoticed for some time. It is believed that these antioxidants may have the ability to replace synthetic ones that are currently being used in food preservatives. 4. Baobab Fruit – Baobab Fruit is grown in Africa and has just recently received approval for export. The fruit has an odd texture as it is naturally powdery. This fruit is full of calcium and vitamin C, making it perfect for those who aren’t able to eat dairy products (or simply don’t like dairy products). Even better, the seeds can be roasted and consumed for additional protein. While it has been approved for export, the fruit still hasn’t hit many grocery stores but it can be found in some yogurts for extra flavor. While there aren’t any foods out there that are going to prevent illness 100% of the time, the foods that are dubbed “superfoods” are definitely worth checking out because they have the nutritious elements that have been shown to reduce our chances of contracting various illnesses and diseases. It certainly won’t hurt to include them in your diet. One of the easiest ways to lower the fat content of your food and boost your heart health is to skip frying foods. When you fry foods, you add a large amount of oil to your food. While fat is something that your body needs, it doesn’t need it in such high amounts. Fat is full of extra calories, so the oil you’re adding to your food will sneak in many extra calories you don’t need if you’re working to eat healthy. In addition, most oils used for frying are not the healthiest kind for your heart. Instead of deep frying your foods, there are a few different ways you can cook them. If you’ve never tried cooking with these methods, you’ll have to experiment to see which one works best for you. One of the healthiest ways to cook is to use your grill. There are several different types of grills. If you prefer to use outdoor grills, you can use charcoal or propane. Gas grilling is quicker, but doesn’t have the same flavor. Indoor grills won’t give you the smoky flavor that you get from outdoor grills. However, they help you to eliminate extra fat from cooking and allow you to cook foods quickly. Using your oven is another option. Old fashioned baking and broiling produces delicious food without having to add excess fat. Baking is the process of cooking your food evenly. When you broil food, you use only the top element of your oven. With baking you get a constant temperature in the oven and your oven will cut off and on to keep that steady temperature. With broiling, the top element will stay on constantly. This can produce the same type of effect as grilling your food. Broiling works well for cooking steaks and other types of meat. You’ll have to turn the pieces of meat over in order to get consistent cooking on both sides. You’ll also need a broiler pan that allows fat to drip through to the bottom away from your food. You can sauté your food in a pan as well. This is a type of frying, but you don’t need as much oil as you do with deep frying. For this type of frying you can usually use one or two tablespoons of oil as opposed to a quart of it. You can also use the most heart healthy oils with pan frying. You’ll want to use oils that are monounsaturated. These oils actually help you to lower your cholesterol. Extra virgin olive oil is generally the best choice for heart health. Steaming is another powerful way to cook. This is especially good for cooking vegetables. You can purchase a special steamer that plugs into the wall or you can actually convert a pan into a steamer by inserting a special steaming basket. With steaming, you’ll add a little water to the pan, then add the steaming basket. You’ll place your veggies on top of the basket. The water won’t actually cover the vegetables at all. You’ll then need to put a lid on the pot. As you heat the water at the bottom of the pan, it creates steam that will surround the food and cook it. Steaming doesn’t take a long time and it’s one of the best ways you can cook to preserve the nutrients in your food. One of the greatest tools you can purchase for your kitchen is a slow cooker. This is a healthy way to cook and can really be a timesaver in your life. With slow cookers you can add ingredients to the pot, set the temperature, and then walk away for hours. This is especially helpful if you have a job outside of your home or just a very busy schedule. You can put healthy foods in to cook but then you can continue with your activities knowing that you’ll have a great meal for dinner. The biggest complaint people have about slow cookers tends to be the cleanup. However, there are liners now you can place inside your slow cooker that make cleaning it much easier. You simply throw them away when you’re done. Many times when people begin to work to cook and eat healthy foods, they try to eliminate fats from their diet. However, your body needs fats in order to function properly. You’ll need to understand the difference between healthy fats and unhealthy fats. Unhealthy fats are those that are saturated. You find these fats in meats and dairy products. You also find them in lard. These are the fats that can clog your arteries and cause you to have heart problems. They’re healthier for the body and actually contribute to good heart health – especially monounsaturated fats. These fats come from plant sources. · Nuts – almonds, walnuts, pecans, cashews, etc. When you’re cooking, you’ll want to use these types of fats as much as possible. Adding nuts or avocado to a dish can boost the heart healthy fats. And they also add delicious flavor and boost the excitement of healthy meals. When you’re baking, you can also make substitutions for fats. For example, if a cake or brownie recipe calls for oil you can substitute applesauce or carrot puree. These will give the same texture and moisture without the fat. If you’re not ready to go completely away from the oil, try substituting half of the oil for applesauce. In many recipes, the oil can be cut in half without significantly changing the texture. You may want to experiment with our favorite recipes. Sugars are another area where people tend to have too much of a good thing. You need to have sugars in order for your brain to work. But the types of sugar that you eat can make a difference. Eliminating processed sugars can boost your healthy cooking. Ingredients such as white granulated sugar, brown sugar, and powdered sugar can be tasty, but aren’t great choices for cooking healthy foods. Instead, you can try to have sweetness through more natural ingredients. Honey and molasses are natural sources of sugar. Raw cane sugar is also a natural source of sugar. While these choices are natural and less processed than other types of sugar, you’ll still want to use them in limited quantities. A little goes a long way. Even better is to get your sources of sweetness from fruits. They naturally contain sugar that can satisfy your sweet tooth while still delivering nutrients to your body. The sugar you get from strawberries, apples, or grapes provides satisfying sweetness and also delivers fiber and vitamins. In addition to getting sugar from sweet foods, many people get a lot of sugar from the drinks they consume. Sugary sodas, sweet teas, and juices can give you a lot of calories without giving much in the way of nutrition. This is a great place to start eliminating sugars from your life. Switch to water with lime or herbal teas that are flavored naturally. If you want to add sweetness, try a natural sweetener such as stevia to add that punch. Other calorie free sweeteners can be less healthy. As you eliminate sugar, you’ll get to a point where you really don’t crave it as much. Another considering with healthy cooking is lowering the amount of sodium, or salt, in your diet. Salt can cause problems with high blood pressure and bloating. While you need some salt in your diet for good health, most people get too much. This way you can control how much salt you add to your meals. When you do use salt, choose natural sea salt. For many people the idea of healthy cooking is synonymous with bland food. But if you’re going to cook healthy it’s critical that you enjoy what you’re eating. Otherwise you won’t be able to adopt these techniques long-term. It’s important to make sure that while you’re eliminating unhealthy fats and sugars that you don’t forget to add flavor. Natural spices and herbs can be the best way to enhance the flavor of your food and can boost your health, too. If you haven’t used many spices before, now is the time to add spice to your life. As you continue to cook, you’ll add more and more spices to your supply. But these are general spices that can get you started. You’ll also want to consider keeping fresh herbs on hand. Growing your own is the least expensive way to enjoy them. As the season begins to end, you can chop up your herbs and freeze them in ice cube trays. This way you can continue to enjoy them year round. Adding fresh spices will make any dish more flavorful. Remember that healthy cooking doesn’t have to be boring and bland. The more flavor you add, the more you’ll enjoy what you’re eating. If you’re not familiar with cooking healthy, it can take some time to adjust. But as you add a new technique you’ll find that it can be easy and rewarding. The most common complaint by people who desire to start eating healthier foods is the price for these foods at the grocery store. If you’ve ever compared the prices of organically grown apples to regular apples then you know how much more expensive the organic ones are. The same is true for whole grain crackers versus regular white crackers. However, not everything is just like it first appears. Maybe it is more expensive to buy whole grain crackers, but what if you bought a bag of whole wheat flour and made your own snacks? You would be able to make a lot more snacks with that bag of flour than you would be able to buy for the same price. Sometimes, we have to change the way we think about health foods and their prices in order to get the most bang for our buck. Below are a few tips. It’s easy to get excited over a good deal – like a $2 bag of potato chips that you’ve got an additional coupon for. However, we all know how unhealthy potato chips are. You may be better off purchasing a 3 lb. bag of potatoes for $2-$3 than the potato chips. Why? The potatoes will last longer and you’ll be able to make more nutritious dishes with them than you can the potato chips. The above example is true for most processed foods. While at first glance, they appear to be cheap, they really aren’t when you consider how much more you can get when you by the whole food version. In other words, instead of purchasing the processed foods, purchase the whole food ingredients instead. For instance, instead of buying a loaf of bread – buy a bag of whole wheat flour and make your own! You’ll not only get more bread for the price, but you’ll also get healthier, better-tasting bread too! Nothing will make you go over budget faster than meat. Meat is expensive, that’s all there is to it. While it’s not very cost-effective to replace your meat with substitutes such as tofu, you can save money by purchasing other protein rich foods such as beans and brown rice. This doesn’t mean you have to cut out all meats, but reducing your meat consumption will definitely help your grocery bill. 3. Shop for seasonal foods. When you begin shopping for healthier foods, you’ll most likely start buying more fruits and vegetables. In order to stay under budget, you will need to stick to the foods that are currently in season. Out-of-season foods are much more expensive than in-season foods. And, you can always buy extra of the in-season foods and can them yourself (or freeze/dry), giving you the ability to eat them when they are out of season! 4. Shop the outside edges. The healthiest foods are found on the outside edges of the grocery store. The prepackaged, processed foods are found in the center aisles. Therefore, purchase the majority of your groceries from the outside edges rather than the aisle-foods. Now, keep in mind some whole grain foods are found in the aisles such as flour and dried beans. However, this is the exception to the rule…most of the foods in the aisles are not healthy foods. There are certain necessities everyone needs to survive, one of these is food. t is possible to save money on the foods you eat, even if you are eating healthier foods! So much money is wasted when we choose to go out to eat, whether it’s for a quick lunch or dinner at a restaurant. Not only is a lot of money wasted when we eat out, but most of the time, the food is not as healthy either. Therefore, you can eat healthier meals and save money by eating food from home. Does this mean you have to eat all of your meals at home? Nope. If you work away from home, consider packing your own lunch and eating at the office. If you cook meals at home, then simply bring leftovers for work the next day. You can even bring your own tea, coffee and/or snacks with you to work, which will save you even more money. It’s hard to turn on the television without seeing an advertisement for a “great deal” at a nearby fast food restaurant. Most people think that if they can get lunch for two for under $10, they’ve gotten a good deal. However, upon close inspection, fast food isn’t nearly that good of a deal. Even if you eat off the dollar menu. Not when you consider that you can fix yourself a healthier, homemade sandwich from home for far less than a dollar. Restaurants and fast-food business make a ton of money on the drinks they serve. A regular sized drink (aside from water) will cost you $1.50 to $3.00 at most eating joints. However, you can get several regular sized drinks for less than $1.50 when you by a 2-liter or family sized tea bags and make your own drinks. If you prefer bottled water, consider investing in a reverse osmosis system (if you don’t have one), or even a cheaper water filtering system, and bring your own bottled water from home in a reusable bottle. You’ll save a lot of money here too. 4. Buy Extra – If you find something on sale at the store that can be easily preserved, by it in extra quantities. This doesn’t mean you have to be extreme about it like the people on Extreme Couponing shows, but stocking up on a few items here and there to save money, is a great idea. Generally, it’s not the food that is damaged, but the packaging that was damaged during transportation, but grocers still discount these items! In the past, many people didn’t think twice about going to a restaurant for dinner or swinging through the drive-thru on their way to soccer practice. However, with the condition of the economy and the impact it’s had on people’s bank accounts, many people are now opting to cook at home instead of heading out for meals. Not only does it save money, but it’s also a healthier alternative too. Below are a few benefits associated with cooking at home. 1. There are no “mystery” ingredients. When you begin to cook meals at home for your family, you become aware of all the ingredients that you and your family are eating. This isn’t the case when you go out. Not only are there no “mystery” ingredients when you cook from home, but you can also control the levels of sugar, sodium and other caloric content too. Additionally, when you cook at home, you don’t have to worry about whether a meal really is “whole/multi-grain” as advertise, because you can switch up the ingredients yourself to make sure it is! 2. It’s a lot healthier for you and your family. As mentioned above, you control the ingredients when you cook your own meals at home. 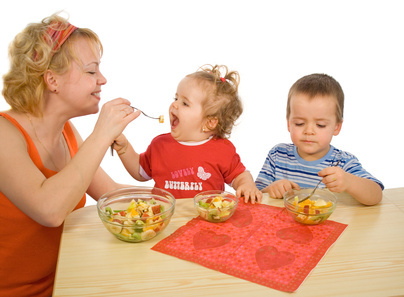 This means that you are able to feed your family much healthier foods than you would if you went to a restaurant. You can ensure the meals you cook include fresh produce and healthy, whole foods…this is a rarity at restaurants and fast-food chains. Additionally, not only are families who eat home-cooked meals generally healthier in body, but studies have shown that they are also healthier socially and emotionally because they’re spending more family time together. 3. You’re able to plan out meals in advance. Cooking at home allows you the ability to plan out dinner in advance. Instead of eating “on the fly” and choosing a restaurant at the last minute, your meals are thought out and planned in advance. Many people even cook several meals at home at one time and then reheat them in the oven on the night they want to eat them. This is often great for busy families who are always on-the-go. 4. There really isn’t that much time involved. A lot of people dislike the idea of cooking at home because they think it takes a long time. However, cooking from home actually takes less time than going out to eat does. Just think about how much time it takes to load everyone up, drive to the restaurant, be seated, order the food and get served. The majority of home-cooked meals only take 30 minutes to an hour to prepare and clean-up doesn’t take long when you get the whole family to help. When you compare the two scenarios, cooking from home actually takes less time than eating out. Making the decision to start cooking healthy is great, but there is some basic cooking equipment that you will need first. The list of supplies below will help cooks of all skill levels create quick and healthy meals for their families. 1. 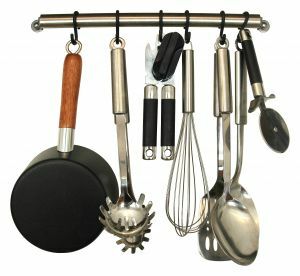 Cookware – You’ve probably got an assortment of pots and pans already, which is good. However, you may find it beneficial to replace some of your current cookware pieces with more expensive, longer-lasting pieces. Cast iron is a great cookware option as it’s made for durability. Additionally, cast iron is said to help boost the nutritional value in foods as it impart iron. Other healthy cookware options include copper-bottomed stainless steel and enamelware. 2. Blender – If you want to eat healthier, you definitely need to invest in a good blender. Blenders will allow you to make a quick fruit smoothie as well as a number of other things. For instance, you can use a blender to make fresh mashed potatoes, homemade salsa, fruit and veggie purees and much more! 3. Pressure Cooker – A pressure cooker is another great tool for the healthy cook. Not only will it save you time, but it will also keep more nutrients locked into the foods you cook in it. You can cook foods such as dried beans, brown rice, vegetables and even meats in a pressure cooker…in far less time! There is a wide variety of pressure cookers available for consumers, making it easy for you to find one in your price range! 4. Knives – Every cook needs some good knives in the kitchen, regardless of whether you’re cooking healthy or not. While you don’t need an entire set of good knives, you will need two or three reliable knives. Some knives are very expensive, but remember that a good knife can last a lifetime when cared for properly. In addition, good knives make preparing food much easier. The three knives you should start with are a bread knife, paring knife and a large chopping knife. 5. Food Scale – Many people think food scales are a waste of space. This is not true, especially for those who want to start cooking healthier meals. Food scales allow you to count calories, control portions and measure precisely for recipes! 6. Juicer – Finally, every healthy cook needs a good juicer. Juicers are similar to blenders, but they are a little different in the fact that they remove plant fibers in foods such as carrots and wheat grass – a blender isn’t able to do that. What’s the benefit of this? Many believe that the body is better able to absorb nutrients into the bloodstream when the digestive system doesn’t have to mess with extra fiber. you can eat low-fat meals and still feed your whole family! Below are some tips to help you get started. 1. Some fat is good. The big mistake made by many people who start low-fat diets is that they try to cut out all fat. Don’t do this. You’re body actually needs some fat in order to absorb fat soluble vitamins, such as Vitamin D.
Therefore, don’t eliminate all fats from your diet…be sure to keep healthy fats in it. 2. Look at low-fat options. More than likely, you’ll be able to easily find high-fat foods upon a quick inspection of your refrigerator. To get started on your low-fat diet, replace these foods with the low-fat versions. This is especially true for dairy products. Almost every recipe calls for dairy products, using the low-fat products will help you reduce the fat content you and your family consume. You can also find many products in fat-free versions too, which will help even more! 3. Cook with lean meat. When it’s time to purchase meat, choose meats that are lean. If you are going to cook with ground beef, get the 93/7 cut. 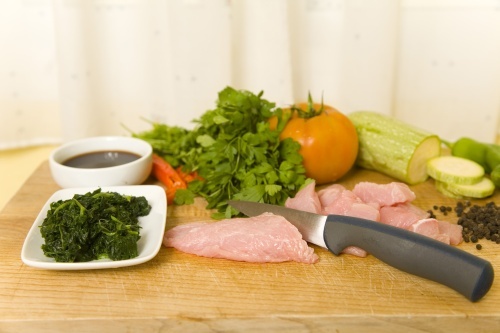 Also, start cooking with other lean meats such as fish and poultry. While salmon is a “fatty” fish, it’s good for you because it contains the healthy fats your body needs…therefore, don’t be afraid to fix salmon for dinner one night. Frying foods adds an enormous amount of fat to meals. Therefore, learn how to steam, bake, broil and poach foods instead. When sautéing foods, use broth instead of oil. If you must use oil to cook with, use olive oil. While there are some benefits to cooking with cast iron, this cookware is very heavy and actually requires a lot more oil/grease during cooking to prevent foods from sticking. This isn’t the case with non-stick cookware. So, you might consider switching to non-stick cookware. 6. Learn healthy substitutes for baking. A lot of recipes call for some kind of fat. You can actually replace most of these fats with plain yogurt and some fruit purees (apple and prune are the best). Therefore, start reducing the fats in recipes by using these healthy substitutes. 7. Always stock low-fat, plain yogurt. For people who want to start cooking low-fat meals, stocking low-fat, plain yogurt is a must. You can use this as a substitute for sour cream and even strain it for a cream-cheese texture. And, instead of using heavy cream, thicken sauces with the yogurt! Many people don’t think much about the animal products they purchase at the grocery store, but most of those animals are fed grain. The most common grains used to feed animals are soybeans and corn. While this has commonly been an acceptable feeding method for livestock, now there is a movement supporting pasture-fed animals over grain fed animals. There are several advantages of using animal products from pastured and/or grass-fed animals. And, if you’ve noticed at the grocery store, it reflects in the price. Below are some of the benefits of purchasing pastured/grass-fed animal products. Studies have shown that grass-fed beef has a lower E. coli bacterial count than grain-fed beef does. These studies have also shown that the stomach acid found in grass-fed beef is much more likely to consume the E. coli that is found in these animals, which makes it even safer. There is a difference in the taste and look of the pastured and/or grass-fed animals products compared to those raised on grain. Just take the eggs from a pastured chicken and compare them to the eggs of grain-fed chickens…the yolks not only look different, but they taste different too! The meat from grass-fed beef and poultry is also better tasting than that from grain-fed animals. There are greater amounts of Omega-3’s, Omega-6’s and CLAs in grass-fed meats too. Additionally, these meat products are generally leaner too. Grains help fatten up animals so farmers can make more money at market, sadly, the extra fat gets passed on to the consumer through the meat. When animals are being pastured instead of grain-fed, they are not only being fed, but making good use of the land. The majority of animals that are grain-fed are raised in feed lots. These feed lots are not only crowded, but unsanitary because of the waste build-up. When storms occur, the run-off can easily be contaminated with the waste found in feed lots. In addition, biodiversity of plants is encouraged by pasture-feeding animals, which is beneficial to the nearby ecosystems. Finally, a tremendous about of land is used for raising crops for grain-fed animals. This land could be used for pasture-feeding instead. Finally, animals that are allowed to graze in their natural environment (pasture land) instead of being cooped up in a crowded feed lot are happier. Disease is also a less prevalent problem in grass-fed animals than in feed lots too. And the animals are generally treated better when let out to pasture than those found in feed lots. You may have heard people talking about the good deals they’re receiving through their vegetable box scheme/CSA (community supported agriculture). For some, these programs are great because both the local farmers and the consumers are getting a good deal. Basically, local farmers are supported through investments made by consumers and in exchange, the consumers receive fresh fruits and vegetables. Sounds pretty tempting, right? Before you make the commitment, read through the following considerations first. It’s best to know what you’re getting into before you sign up. Basically, when you sign up for a CSA box or vegetable box scheme, you agree to pay a set fee for a full season and in return, you will receive a box of fresh, season produce in scheduled intervals. It may be once a week, bi-weekly or once a month, it just depends on what the conditions are in your agreement. The produce you receive will be seasonal produce. You won’t be getting any out-of-season produce, so you need to keep that in mind when deciding what season to sign up for. There are several benefits for joining a CSA or vegetable box scheme. · It’s better for the environment as it take much less time and distance to get the produce from the farm to your house. This also means the food will contain less preservatives too. · The produce is fresh and in-season. · Generally, these plans are more cost-effective as you don’t have to pay additional money for the fuel it takes to transport the produce to the store. · You’ll receive fruits and vegetables you’re not used to eating, which will expand you and your family’s food palate. 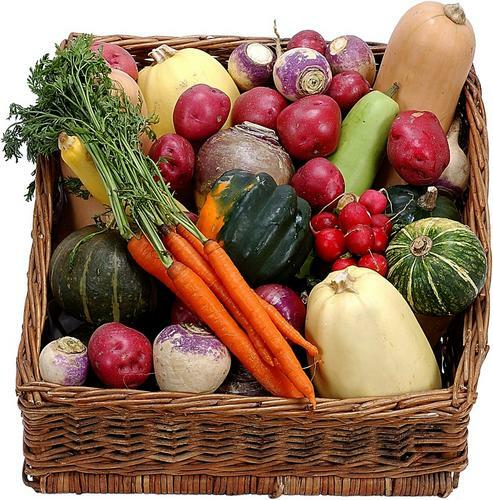 · It feels good to support community farmers and eat healthy, organic foods. · You have to commit to a full season, and possibly a year. It doesn’t matter if you’re happy with the service or not, you’re committed for the terms of the contract. · It’s possible that you will receive fruits and vegetables that no one in your family likes and you don’t know what to do with. · You are not able to choose what produce you receive. You get whatever is available. There may be times when a substitution is made. For instance, you may receive eggplants if bell peppers didn’t do well that year. · It’s possible that you may lose your produce if you are unable to make the scheduled pick-up time. So, How Do You Find a Good Program? Basically, start by asking around in your community. Find out who offers these programs and what they are selling. Word-of-mouth will also help you determine which farmers have the best reputations and which ones have bad reputations. Visiting the local farmer’s market is a great place to find knowledgeable people about the subject. You can also search online as well. The food pyramid guidelines suggest that you eat around 4-6 servings of vegetables a day. If you are not keen on eating them, then this can be a problem. One solution is to learn how to incorporate more vegetables in your meals in a way that disguises them - get sneaky to get healthy! Now that you have finished reading this guide you should have a better understanding of what it will take to transition into living a healthier lifestyle where you cook healthier meals for you and your family. You also now have some helpful information on ways that you can eat healthy on a budget and save money on food – which is the number one complaint people have when it comes to eating healthy (how much more expensive the food is). And last but certainly not least you even have some tips on ways that you can get your kids to eat healthier too! Below here I'm featuring more pages with helpful how-to-do-it tips on how to learn healthy cooking. What Does "Natural" Really Mean on Food Labels? What's the Difference Between Non-Greek and Greek Yogurt? 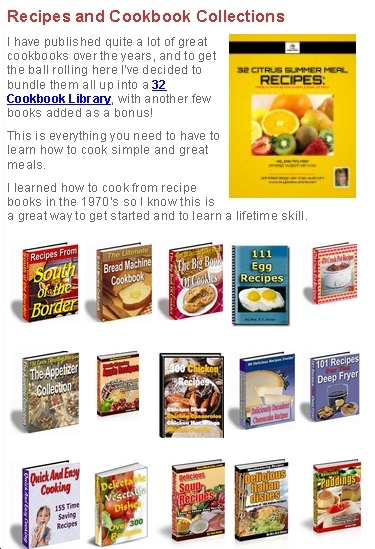 Back to HOME PAGE of this how to learn healthy cooking section of the site.